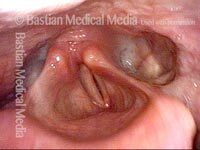 Panorama of the laryngopharynx. 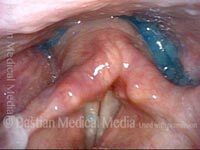 Note the capacious left pyriform sinus (right of photo), one strong indicator of paralysis of the pharynx on that side. Blue-stained water swallowed by the patient has preferentially pooled in the left pyriform sinus (right of image), due to weakness of the left inferior pharyngeal constrictors.